A young boy tries to keep up with Bear as he visits a variety of places while trying out different forms of transport. They travel by bicycle to the market, by raft to the forest, and by train to the seaside, just to name a few! 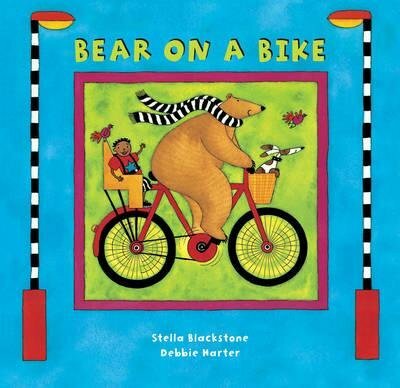 Bear on a Bike is a brightly coloured picture book that is packed full of detailed scenes to explore - label all the food at the market, describe the forest animals, and laugh at the silly things happening on the beach. The multiple setting changes in the story can be used to introduce children to different story settings. The text is structured in a question-and-answer format, which is repeated on each page: "Bear on a bike, As happy as can be, Where are you going, bear? Please wait for me!" The repetitive and predictable text makes this a fantastic book for creating auditory closure opportunities (e.g. “bear on a….” wait for the child to name the appropriate transport). For further speech and language targets in Bear on a Bike, see the list below.